I'm excited!! Are you excited?! I've been waiting for about a month to share our newly renovated living room with you guys and the day is finally here! Let's take a look back at where we started! Ok, where do I begin? Let's start with the fireplace. It was one of the main reasons we fell in love with the house. It's massive and we knew it could be an incredible focal point. We weren't in love with the color of the brick so we decided early on to paint it. The beams in the ceiling needed to come out because it just felt too low. Little did we know there would be an extra 2 feet of empty space above the existing ceiling! The previous owner put in new carpet before we moved in but we knew we wanted hardwoods throughout the entire main floor so we took the carpet back out. Oh! And the front door that you can barely see on the left was painted red and green so we had a fun Christmas theme in the middle of summer. But enough of this picture....let's get to how it looks now! Eeek! I just love this space! Ok so the biggest change was by far the fireplace wall! Like I said earlier, we knew we wanted to paint the brick white so after 7 (SEVEN) coats of primer and paint we got it to a crisp white. 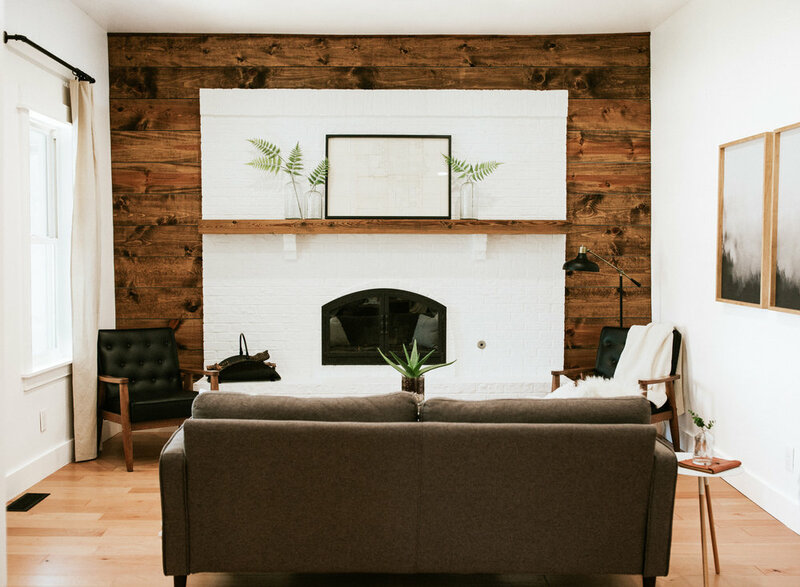 We also knew that we were going to paint the other walls the same color of white so in order to create dimension and keep the white fireplace a focal point, we created a wood wall behind it. We kept the existing mantle (just refinished it) as well as the black glass doors on the fireplace. Both looked beautiful once we cleaned them up. If you scroll back up to the before photo, you'll see that the ceiling was the same height as the top of the fireplace. When we took out the ceiling we raised it up an extra two feet making this space even more dramatic. Plus this is actually a fairly small space so a tall ceiling instantly made it feel bigger. We also put in all new drywall, flooring, trim, and lighting. Side note: this room didn't have a single overhead light so we went crazy and covered the ceiling with recessed lights! I like a bright room. Since the fireplace wall was the main focus of this room, I didn't want to compete with it by putting anything too overpowering on the white wall next to it. After a ton of research, we finally found a set of abstract prints resembling a foggy forest and we love them. They blend perfectly with the style of the room but don't demand too much attention. The mantle artwork took months to figure out because I'm waaaay too much of a perfectionist when it comes to mantle decorating. We settled on an antique map from Chris' granddad. I made the frame for it, painted it black and it accents the rest of the room perfectly. For our furniture we kept it fairly neutral and Mid Century Modern. Nothing too flashy but its all stylish enough to stand out on its own. After realizing that my dream couch was nearly $2,000 I had to come up with plan B. It took some research but I found this equally beautiful couch for under $400!!! (Ya...I was just as shocked by the price as you probably are!) I love the charcoal gray fabric and somehow it doesn't show our dog's blonde hair which is a MAJOR bonus! See that brick chimney behind the couch? That was covered up by some yellow paneling! We ripped it off and exposed the brick! It's such a beautiful accent and showcases the age of our home. The entryway (which is actually just a corner of our living room) is simple but 100% styled for function. Believe it or not we got rid of the Christmas colored door and put in a new wood door instead. The living room only has one window so it was obvious we needed to put in a new door that brought in as much light as possible while still providing some privacy. We found an unfinished door and I stained and sealed it. We love how it turned out! Once we got all the major pieces in place we just filled in the gabs with decor and greenery to bring life to the space! I love that our home is totally neutral with a few pops of greenery from the plants. We love our living room and we are so stinking thankful for a comfortable place to sit down, have a fire, and relax. We didn't have those things for quite some time and we definitely do not take it for granted. Here's a quick before/after shot! Thanks for checking out our living room! If you saw something you love and want to know where it's from, I linked all products we used here! I even talk briefly about how we made our wood wall in this post. Go check it out! P.S. Are you curious to see what our newly renovated kitchen looks like? The before/after photos are CRAZY!! Check out the kitchen here!